Amanda Simmons/ Press-Tribune | Pictured (left to right) are David Hamm, Haughton Police; Ricky Bridges, Assistant Chief, Haughton Police; Waylon Bates, Principal of Haughton Middle School; Rodney Farrington, Police Chief, Haughton Police; Richard Warren, Assistant Principal at Haughton Middle School and a reserve officer. Haughton Middle School has donated proceeds from a food fundraiser to assist the Haughton Police Department. Principal Waylon Bates presented a check for $200 to Police Chief Rodney Farrington that will be used to purchase Belt Trauma Kits for the department. The kits will be purchased through Blue Forever, Inc., a non-profit founded by 2013 Haughton High graduate Kellie Abbott. Blue Forever, Inc. works to increase the awareness for Police Officers Safety and to raise funds for purchasing lifesaving QuikClot Belt Trauma Kits (BTK*) for law enforcement officers locally and throughout the country. When Abbott first started raising funds and donating kits through her senior project, one of the first donations made was to the Haughton Police Department. Since that time, the department has grown and more kits were needed. 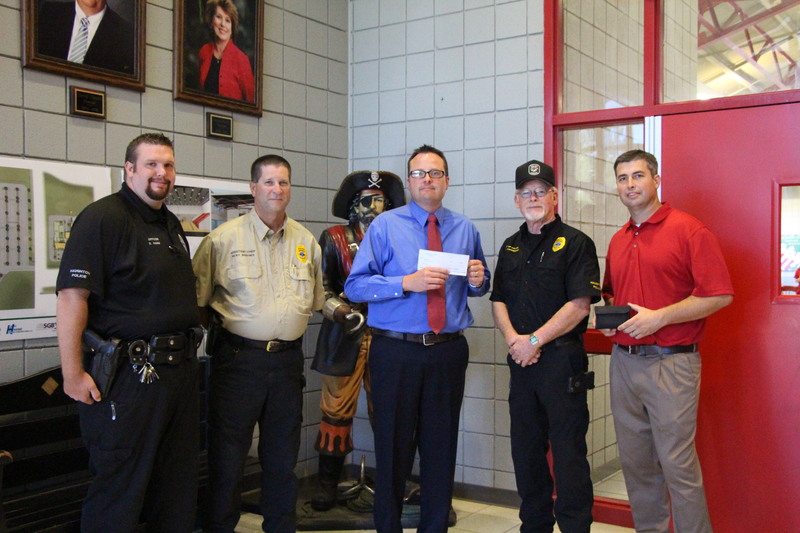 With these new funds from Haughton Middle School, the department will be receiving those additional kits. Each kit contains gloves, a CPR shield, SWAT-T pressure tourniquet and QuikClot Combat Gauze LE, a flexible material used to temporarily control traumatic external bleeding. Bates said he would like to continue doing the fundraiser in the future. Visit www.blueforever.org or www.facebook.com/blueforeverinc for more information on how to help save a life.